This thumb-shaped state is characterized by wholly mountainous terrain. Almost the entire state is hilly, with an elevation ranging from 280 metres (920 ft) to 8,585 metres (28,000 ft). Ninety percent of the State population is rural and agriculture is the primary source of livelihood for the villagers. However, the contribution of agriculture to the state GSDP has been showing a declining trend, indicating a stagnation and reduction in income due to reduction in productivity and production of the major cash crops, namely, ginger, large cardamom and orange which are also facing pathological problems leading to low income levels in the villages. The sectoral contribution of agriculture to the GSDP has declined from 52% (1980-81) to 21% (2004-09). Dairy activities, contract works, construction, hydel -power development and tourism are the other main sources of income in the villages. One of the major constrains in the development of the state is the average size of land holding of 1.3 hectares coupled with the irrigation problem. Out of the total cultivated land of 109,963 hectares only 11% is irrigated. Dry land constitutes 58% of the total cultivable land. Limited irrigation coverage, mostly rain fed farming, high percentage of wasteland, coupled with reduction in production and productivity of horticulture crops has resulted in stagnation in farm income which further leads to the decline in contribution of agriculture to GSDP. 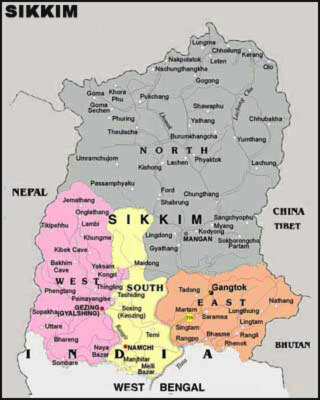 The poverty belt of Sikkim is essentially the rain shadow area in the south. To combat these problems, Government of Sikkim has initiated various developmental programmes, namely, MGNREGA, Swarna Jayanta Gram Swarojghar Yozana, Integrated Rural Energy Programme, Jawahar Gram Samridhi Yozana (JGSY), Sampoorna Grameen Rojgar Yozana (SGRY), Community Development and Panchayat Scheme, Rural Water Supply & Sanitation Scheme, Rural Roads and Bridges Scheme and Rural Housing Scheme.